Ah! The tip for putting the waffles in the oven – that’s probably why my waffles always leave me dissapointed. On another note, I wish I had all the monies to give you. Maybe we can do an old school Bmore lemonade stand….or more logically, a table at the farmers market under 83. I think that rest in the oven is what makes the waffles magical. Because really, most everything is better after a rest isn’t it? Sadly, I don’t think my pictures are going to plug the fundraising gap. Who knows maybe I would have more luck with a lemonade stand…or a waffle cart. Why not have a waffle sale? But that is a lot of waffles! The scale of how many waffles I would have to sell boggles my mind. Although I think that would be a fantastic idea for a food truck. Waffles for lunch anyone? I hope you guys have an unexpected financial miracle fall into your lap. And methinks I need a waffle iron. Because these look too good to pass up, even if they don’t become a cash cow! I have to believe that if this is to be our path, then the details….even the ones that keep me up at night…will come together. If you have the room for it in your kitchen, I think a waffle iron is worth its weight in gold! what could i use in lieu of the buttermilk powder? 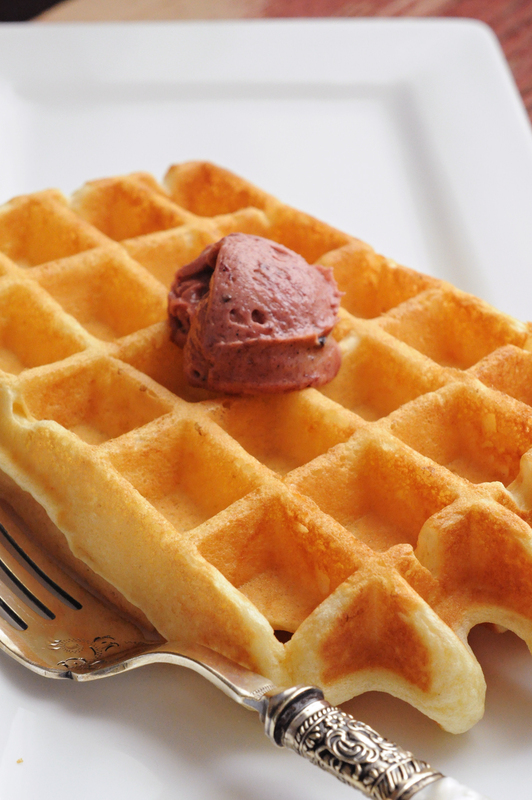 i might have to experiment with non-dairy coffee creamer… i’m always on the lookout for a good waffle recipe. I wouldn’t try and sub non dairy creamer for buttermilk powder.� That sounds like a recipe for disappointment.� Maybe take your favorite waffle recipe that you’ve already made dairy free and try the low oven rest trick??? I am surprised you have room in what you have described as a tiny kitchen for a waffle iron. I have always thought of it as such a unitasker. But this recipe could make me make room. Delicious picture! Well you see, there is this cabinet above the stove that holds the bulky unitaskers – waffle iron, toaster, and muffin pans. I have to trust that the Universe has a plan for us. Wendi’s kitchen has a lot of storage. But if you wanna see a tiny kitchen…well, come over to my place sometime. Also, Wendi, my mind totally went to food truck. If the crepes people in Pittsburgh can do it, why not waffles? Somebody needs to run with the waffle food truck idea.� Not me mind you.� But this could be awesome. Why does it pain you to say it’s ATK recipe? I had an emotional and philosophical breakup with ATK several years back. I’m still torn when it comes to their recipes…they work but buying the magazines and cookbooks generates profit for them which really just rubs me the wrong way. The seltzer really limits the make ahead-ness of this waffle batter. You could mix your dry ingredients together and your wet ingredients (minus the seltzer water) together the night before and then just combine seltzer, wet, and dry in the morning. These Yeasted Waffles are better suited to being prepped the night before. What’s the difference between seltzer and sparkling water? I’ve used both in this recipe depending on which I have on hand and I can’t tell any difference. My understanding is that seltzer is plain water that has been carbonated (think SodaStream). Sparkling water usually has natural occurring minerals in the water. I’m a fan of using what you have on hand as long as you get a reliable result.